Red Wheel ∕ Weiser Online Bookstore | The Adolescent Relapse Prevention Planner by Jennifer Bruha, Ph.D.
Substance abuse continues to be a problem in society, particularly among adolescents, who are exposed at younger ages to new and stronger drugs with higher addictive potential and greater availability. In response, award-winning teen addictions clinician and research expert Dr. Jennifer Bruha has created an insightful and innovative new workbook that helps counselors, parents and adolescents themselves deal with the challenges of teen addiction and craft a realistic plan for change. The Adolescent Relapse Prevention Planner contains a variety of educational information, discussion topics and exercises around substance abuse that can be used both for individuals and groups. The writing tone, as well as the structure of the exercises, are geared to the teen level; the entire process is designed to be intriguing, thought-provoking, psycho-educational and even fun � making treatment and the recovery process more personally empowering manageable and more achievable. Bruha addresses recovery from addiction through the stages of change, from overcoming denial and acknowledging that they have a problem with substance abuse; learning more about drugs and exploring the short- and long-term consequences; examining ways to quit, and how to set up structures to prevent relapse; and maintaining a healthy lifestyle every day, then every week and every month. Jennifer Bruha, Ph.D. was born and raised in the San Francisco bay area, the eldest of two daughters to Donald and Janis Bruha. She attended the University of California, Los Angeles, where she earned a bachelor�s degree in Psychology, followed by a master�s degree in Counseling Psychology and a Certificate in Chemical Dependency Counseling from Notre Dame de Namur University. She earned a second master�s degree and Doctorate (Ph.D.) in Clinical Psychology from the Institute of Transpersonal Psychology. She has been working as a clinician since 2003 at Our Common Ground, an adolescent residential treatment facility in Redwood City, California, and at the East Palo Alto adult treatment facility since 2009. She designed the Drug Education and Relapse Prevention curriculum at both facilities and continues to facilitate both groups. Her clinical and research interests include addiction, eating disorders, and trauma. In 2010, she was awarded the Alice Kahn Ladas Research Award for her research in mindfulness and eating disorders from the United States Association of Body Psychotherapy. 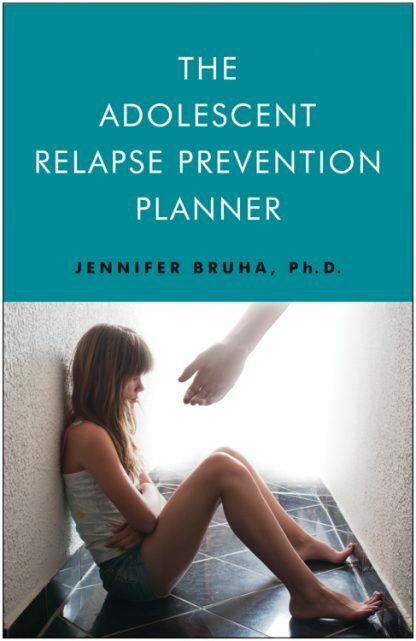 The Adolescent Relapse Prevention Planner is her first book.